The stars and brains behind the BFI London Film Festival‘s Closing Gala Feature were out in full force yesterday at London’s May Fair Hotel. 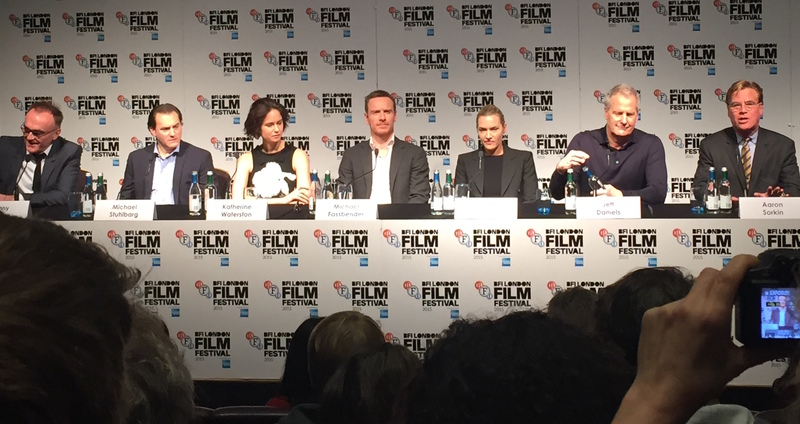 We were lucky enough to speak with actors Michael Fassbender, Kate Winslet, Jeff Daniels, Kate Waterston and Michael Stuhlbarg, plus director Danny Boyle and screenwriter Aaron Sorkin, who talked about their new film, Steve Jobs. To give some context, the new biopic about the Apple co-founder and CEO employs an innovative approach to filming and structure, as it is presented in three acts – each one representing the 40-minute period preceding a product launch. Act I takes place in 1984, before the launch of the Macintosh computer. This is then followed by Act II, which explores the launch of the NeXT project, while also featuring flashbacks to Jobs’s dismissal from Apple years before. Finally, Act III skips ahead to 1998, where Jobs prepares for the launch of the iMac. Danny Boyle: “[Jobs] has changed our lives … both in an obvious way, with communication via the phone, but in so many other ways, this drive towards the digital world that we now live in … We were very lucky, as we were able to almost illustrate it. “We shot the first act on 16mm, because it was the earliest act, but also because … [Jobs] felt like a guy fighting all these impossible forces that were stopping him getting to this vision. It felt like a rough, home-made version, as if they’d almost done it in the garage themselves. “Then we moved to 35[mm] for the second act, which is a beautiful storytelling act, and an illusion … And then we moved to digital. The third act is set in 1998, and although the [Arri] Alexa camera, which is what we used, wasn’t generally in use then in cinema, Jobs had already got there, of course. He released Toy Story in ’96, and I remember going to see it in Leicester Square, and thinking that the world had changed … that was just an earthquake. So it was great to pay him that respect. Danny Boyle: Out of respect I rang him up and said ‘We’re using 1984’, as he shot the 1984 advert which Michael and Jeff stand in front of, but we didn’t ask his permission; the basic principle we worked to was we sought forgiveness, rather than asked permission. Which is a very sensible way to do it in this business, if you can actually get away with it! Aaron Sorkin: “I don’t know what a ‘fair’ sense of anybody is, really. If you asked a thousand people who knew Steve Jobs for their impressions of Steve Jobs, I think you’d get a thousand different impressions. What you don’t see in this movie is a dramatic recreation of his Wikipedia page. What you see is a dramatisation of several of the personal conflicts that he had in his life, and they illustrate something. I do believe they’re fair; my conscience is clear that we haven’t done anything unfair. Michael Fassbender: “For sure. The fact that he had a vision back in the mid- to late ’70s and continued striving towards that vision, and here we are all living it now; I think that’s extraordinary passion and commitment and focus. Also, having met people who were close to him, both in the workplace and also in personal relationships, [and seeing] the effect that he still has on these people … and the love that was apparent for the man. Steve Jobs will be on general release in UK cinemas from November 13th.